Edward Anthony's play "Wish I Had A Sylvia Plath" comes to the Burton Taylor Studio in Oxford as part of Oxfringe 2008! The play runs from Tuesday to Friday, April 1 to 4, at 7.30pm with a matinee on Thursday. Tickets are available from the Oxford Playhouse Box Office on 01865 305305. Plath Profiles is making progress. I've recently been informed about a new publication that Sylvia Plath readers might be interested in reading. It is Lady Lazarus by Andrew F. Altschul. The book is about "poetry, punk rock, and suicide." It's the story of Calliope Bird Morath, the daughter of famous punk rockers. Her father committed suicide when she was four years old, and she has grown up to be a "confessional poet," hounded by the media and haunted by her memories of her father. It's set in Southern California during the "grunge revolution" of the early 1990s, as well as in the crazed celebrity culture of the 21st century, and is partly narrated by a washed-up music journalist who has become obsessed with Calliope, her father, and the connections between rock and roll and poetry. Lady Lazarus is not about Sylvia Plath... however, the title is an obvious reference, and in general I think the main character springs from a tradition of troubled artists that includes - and maybe starts with - Sylvia Plath and the mesmerizing speaker of the poem "Lady Lazarus." Anyone who reads Plath's poetry, and is interested in the story of her life, might find something to like in this novel. You can read more at LadyLazarus.com or at the books Amazon.com page. Last night, I updated all the individual works pages on my website for Sylvia Plath, "A celebration, this is". Each page now features bibliographies of reviews that appeared around the time of publication. I wish it were possible to provide links to the articles, but copyright being what it is... Nevertheless, I hope these lists prove useful in reading the very important reviews contemporary to each publication. A note about the page for Plath's Children's Stories. The text there is temporary and unfinished. I should have better content there by Sunday. In 1998, a journal titled Death Studies published a special issue on Sylvia Plath. Death Studies publishes "on significant research, scholarship, and practical approaches in the fast growing areas of bereavement and loss, grief therapy, death attitudes, suicide, and death education. It provides an international interdisciplinary forum in which a variety of professionals share results of research and practice, with the aim of better understanding the human encounter with death and assisting those who work with the dying and their families." If you are interested in a little bit of light, late winter reading, the articles are available in full-text PDF files through Academic Search Complete, which many people have access to via their colleges and universities. If, however, you do not have access and would like the articles, please email me. The following articles appeared in this issue. Firestone, Lisa, and Joyce Catlett. 1998. "The treatment of Sylvia Plath." Death Studies 22, no. 7: 667-692. Leenaars, Antoon A., and Susanne Wenckstern. 1998. "Sylvia Plath: A protocol analysis of her last poems." Death Studies 22, no. 7: 615-635. Lester, David. 1998. "Introduction to the special issue." Death Studies 22, no. 7: 595-596. Lester, David. 1998. "Theories of suicidal behavior applied to Sylvia Plath." Death Studies 22, no. 7: 655-666. Runco, Mark A. 1998. "Suicide and creativity: The case of Sylvia Plath." Death Studies 22, no. 7: 637-654. Shulman, Ernest. 1998. "Vulnerability factors in Sylvia Plath's suicide." Death Studies 22, no. 7: 597-613. Gerisch, Benigna. 1998. "'This is not death, it is something safer': A psychodynamic approach to Sylvia Plath." Death Studies 22, no. 8: 735-760. While many of us were fresh off of participating in the Sylvia Plath 75th Year Symposium at Oxford last fall, James Michie, Plath's editor at Heinemann, passed away. The Guardian's obituary is here. Michie was responsible for seeing The Colossus and The Bell Jar in print. The Woodberry Poetry Room, located in Lamont Library at Harvard, holds typescripts of five poems by Sylvia Plath. The poems are all "addressed" 337 Elm Street in the top right corner. This was her residence at Northampton, Mass. from 1957-1958. "Poem for Paul Klee's 'Perseus: The Triumph of Wit Over Suffering'"
"On the Decline of Oracles"
It is possible these are the typescripts for a reading she gave on 13 June 1958 at the Woodberry Poetry Room, but one of the poems, "Poem for Paul Klee's 'Perseus: The Triumph of Wit Over Suffering'" was not read at the time. (It was also not read on her second reading there on 22 February 1959.) I think these many be somehow connected to the poems she read for Lee Anderson in April 1958, as all five were read at that time. "The Disquieting Muses" has at least one typographical error, but I have not yet closely examined the rest. In today's Guardian, Sylvia Plath is featured as one of their chosen greatest poets of the 20th century. Read it here, now. Over the next week, The Guardian will publish small booklets of poems by the 20th century's greatest poets. The poets include T. S. Eliot (today), W. H. Auden (12 March) Sylvia Plath (13 March), Philip Larkin (14 March), Ted Hughes (16 March), Seamus Heaney (17 March), and Siegfried Sassoon (18 March). Each booklet includes a foreword by a prominent scholar, writer, or critic. Did you know that 49 years ago today, Sylvia Plath and Ted Hughes visited Plath's father's gravesite at Winthrop, Massachusetts? She wrote about it in her journals, "A clear blue day in Winthrop. Went to my father's grave, a very depressing sight..." (p. 473). She later talks about walking on the rocks along the oceanside underneath Water Tower Hill. Today is just like that day. 49 years ago today, also, the Barbie doll was launched. Recently I updated some pages of my other Plath website, A celebration, this is. Updates will be much more regular now than in the past. I have re-designed the thumbsother.html. This is the thumbnail page for limited edition books by Sylvia Plath. In addition to thumbnail covers, the page now lists bibliographic information and the contents of each volume. I have added new images of two broadsides for "Among the Narcissi" and "Ariel"/"Morning Song", as well as the cover for Trois Poemes Inedits, published in 1975. These are poems attributed to Plath but are still uncollected. I plan to add more book covers this weekend or early next week. I've also updated the Dissertations about Sylvia Plath page. Aubrey Menard, the organizer of the Sylvia Plath 75th Year Symposium at Smith College, recently informed me that the website for the event, to be held on 25-26 April 2007, is now online. There may be changes as the co-ordinating continues, so please check back often for further updates to the schedule. There is a great line-up of speakers giving papers, many of which I did not get to sit in on at Oxford, as well as some of Plath's friends from high school and college scheduled to attend. Just an update here regarding 2008 publications by or about Sylvia Plath. 4 March should see the release of A Sylvia Plath / Ted Hughes Chronology by Wim Van Mierlo. This book is priced at $85.00, so save your change or see if your library can get it. 12 August is going to be an exciting day. Harper Perennial Modern Classics will issue both a new Collected Poems and a new Johnny Panic and the Bible of Dreams. Both of these books are listed as part of their P.S. series, so expect a little extra text at the end. 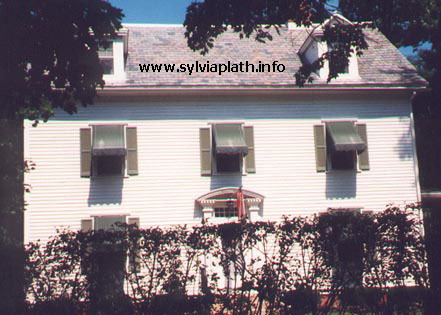 Also in August, look for Writers and their works: Sylvia Plath, by Raychel Haugrud Reiff. This will be issued by Marshall Cavendish Publishers. I've contributed some images to this book and look forward to seeing and reading the book. As usual, I'll keep updating these publications as they are made known to me.